This Australian business started as its founders were trying to find a kennel for their ageing dog. No matter how many they saw, they just couldn’t find one that would keep her warm in winter and cool in summer. Their research also showed that many dog owners had to replace their kennels after their pet had chewed and destroyed their existing wooden or plastic kennels. This inspired them to source a safe, tough but also easy to clean material. 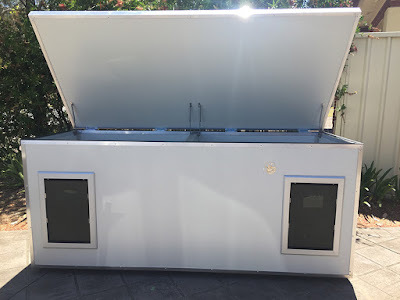 The Colorbond Insulated Panel Kennel was born, but sadly before the first “Patio Style Kennel” was finished their beloved pooch passed on. Physical stress due to the heat or cold can harm your pet. Insulation and protection from the wind are key elements that reduce the severity of this stress. WHAT MAKES KUMFI KENNELS DIFFERENT? 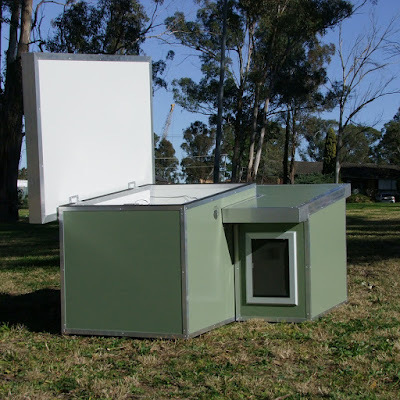 All kennel designs are made of Colorbond Insulated Panels sourced from Australian manufacturers. These are manufactured using BlueScope’s Colorbond® Permagard® steel, sandwiching a lightweight solid Expanded Polystyrene Fire Retardant core (EPS). This material contains Microban® - a unique antibacterial technology that actively helps inhibit the growth of surface bacteria that may cause potential odours, stains, poisoning and allergens. The EPS-FR Core has been tried and tested for over a half a century, the SL Grade core delivers excellent thermal insulation which is derived by the insulation value of air filled cells making up 98% of the product volume. This delivers a safe and natural insulation to the structure. Because no two dogs are the same and we all live in different climates with different needs, Kumfi Kennels came up with a whole range of designs and sizes to fit any pooch’s requirements. 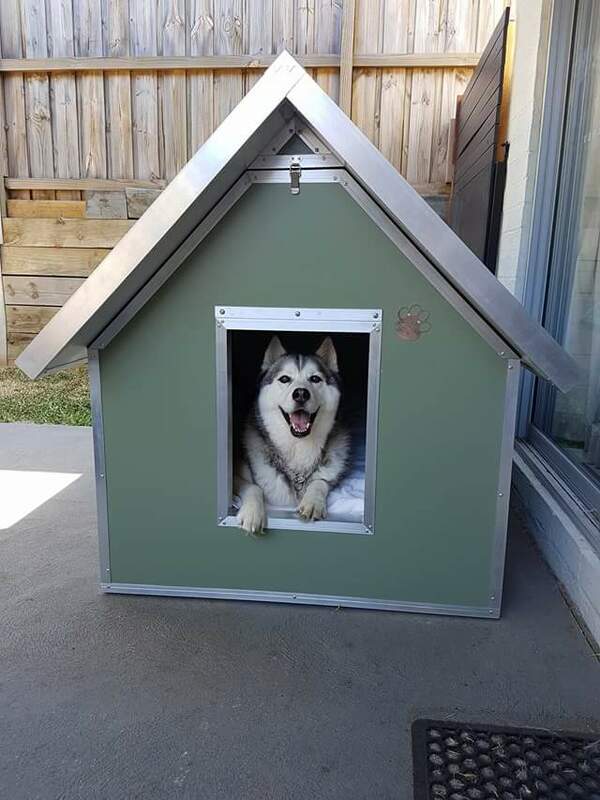 Even a Siberian Husky needs a Kumfi Kennel! This insulated kennel has been designed to be the old faithful. 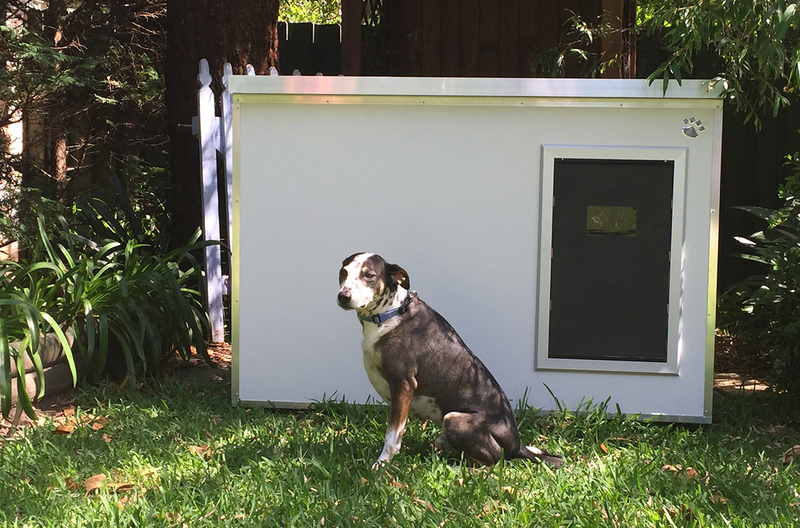 With its traditional feel, a high-pitched insulated panel roof and larger doorway, the Classic Kennel would be a perfect addition to your backyard or working dog’s area. It has a hinged pitched roof for ease of cleaning and routine maintenance. A single latch at the front to help seal the roof in position and a raised floor to keep your pampered pet warm and damp free. The doorway is centered on the front wall, an eave has been built into the roof for that added protection. The insulated panels used have an anti-bacterial coating which makes it virtually impossible for bacteria to grow, as long as a maintenance schedule is maintained! 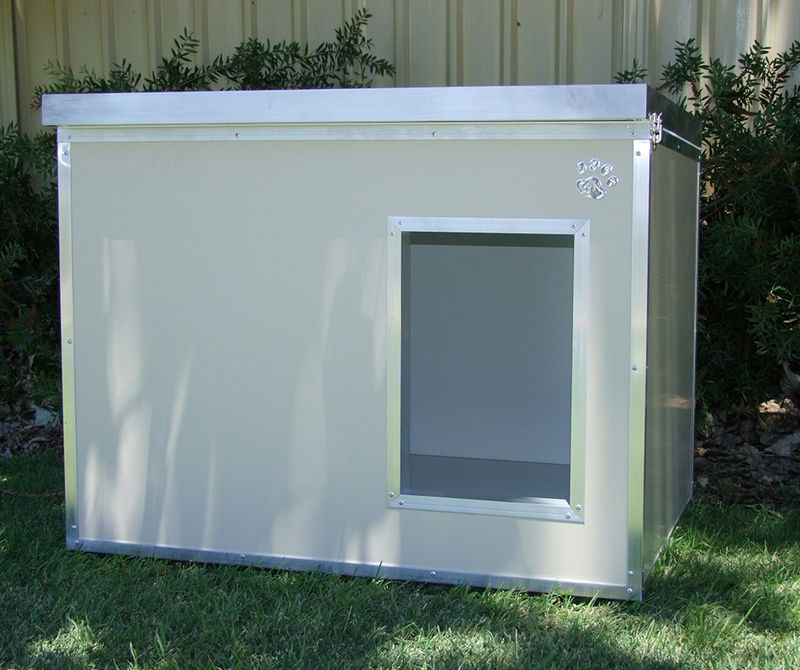 The Patio Style design is a multi-purpose insulated dog house. It suits a corner on the patio in your backyard, a shaded spot along your fence line or can be placed in your beloved pet’s enclosure. Designed to provide maximum protection from the elements whilst giving a comfortable environment to relax in. All Patio style dog houses have a lockable hinged roof which slopes slightly to the rear of the kennel. The raised insulated panel floor aids in creating a damp-free environment. Both the Patio and Classic models are available in 5 sizes (from Small to Extra Large) and will be delivered flat packed with assembly instructions. They can be built for you at an additional charge. Does one pet take up more space than the other or they step on each other's toes? The Dual Insulated kennel provides both your pets personal space to call their own whilst still being together. It comes with a part divider inside which still allows your pets to cross from one side to the other. There is a lockable hinged insulated roof which slopes slightly to the rear of the kennel. The lid opens for ease of cleaning and helps to initially train your pet to use the kennel. The style and size are not restricted and the company will help you bring your designs and ideas to reality. There are multiple options to make your kennel unique, e.g. a solar exhaust fan. There are also accessories to personalise and add comfort to each kennel such as dog doors, dog beds, plywood floor and magnetic lettering! This model has everything your pet needs: a generous size room complete with the added protection of a fenced area (powder coated or chain wire). 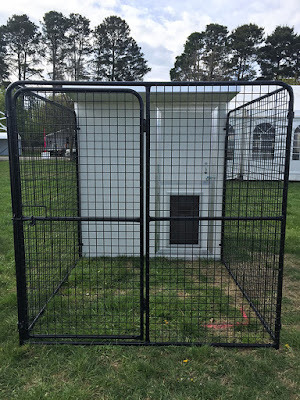 This design is great for working dogs/security dogs who still need a place to call their own. By the away, the Stay & Play is not just for dogs, this is also a great space for your cat to securely enjoy the outdoors without harming the wildlife! You can choose to have an insulated floor or a cement floor inside. You can also add many accessories for extra comfort such as solar light, solar exhaust fan, a window that opens additional air circulation, lockable barn doors, insulated entry doors etc. This option is fully customisable to any requirements or measurements and easy to transport being a module setup. Custom-made Insulated kennels can be designed and manufactured to your requirements. Kumfi Kennels can help you bring your designs and ideas to reality: no project is too big or too small for them! Your kennel will be delivered flat packed with assembly instructions but the company can build it for you at an additional charge. Even if you don't live in the colder mountain ranges or experience extremely hot temperatures, your dog will thank you for his new cosy housing to keep him dry, away from draughts and safe for a lifetime. Does your pet suffer from storm-related anxiety? Are they frightened of loud noises such as fireworks or machinery? Kumfi Kennels are constantly innovating and released this sound-proof Storm Kennel during Winter 2017. Also fully insulated, it consists of a den with enough space for your dog to move around but still feel safe away from the elements and also comes with a secondary ceiling which aids to reduce noise. There is an L shaped tunnel with a dog door for extra protection and to buffer the sounds. A sound system can be added to your Storm Kennel to aid in calming your pet. The Storm Kennel is made to order and comes in 4 sizes (S, M, L and XL). Please contact the company for a quote for all custom order options.